[flash forward] With water boiling on the stove, a couple of children are seeming running around outside. Carol, Tyreese, and the girls are settled in for the night near the tracks but Lizzie cannot sleep. Carol talks with her for a moment about being saved by Tyreese but Lizzie explains that she saved him back at the prison. Hoping to see more kids at Terminus, she asks Carol about whether she had kids. Carol talks about how she misses her, when Lizzie challenges her about whether she will be upset if she dies too. Carol insists that she needs her to get some sleep. Just when she gets down to Tyreese, he appears to be having a nightmare. The next morning, they find some sap in a nearby tree to treat Tyreese’s cut on his arm. Carol warns Tyreese that Lizzie is not aware of the reality of what the walkers really are. As they continue forward, they begin to talk about Tom Sawyer. Suddenly, they smell fire somewhere nearby, but Carol takes an opportunity to stop for water and takes Mika with her. While waiting for them to get back, Tyreese hears something nearby and goes to investigate. The walker ahead trips and falls on the tracks. Just when he is about to kill it, Lizzie stops him from doing it. Out in the woods, Carol admits that she took Mika with her to talk about how to survive. Mika admits that she can kill walkers but cannot kill people. 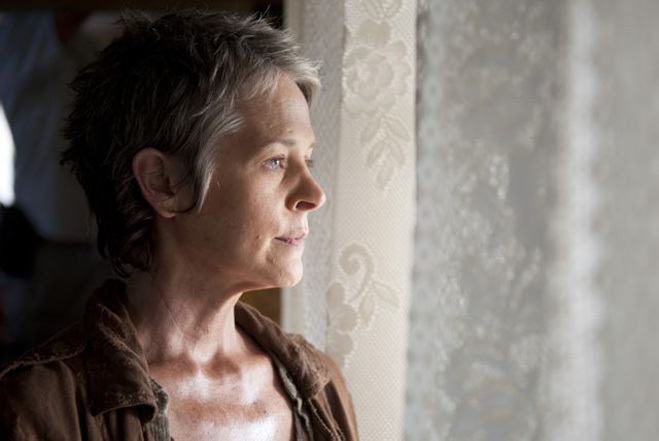 She even brings up the two that Carol killed during the infection outbreak at the prison. Carol pleads with her that she needs to be able to change how she deals with danger, but they exit the woods and find a clearing with a house out in front of them. Regrouping, they head in the direction of the house. Happy about a chance to relax, they notice the smoke in the distance. They go up to the house and Tyreese and Carol head inside to clear it out. Lizzie and Mika get into an argument about the walkers when one falls out of the house. Lizzie tenses up but Mika is able to draw her gun and take it out in 3 shots. Mika helps Lizzie calm down after she gets upset from the encounter. Later that evening, Lizzie admits that she is still a little upset. Mika runs in with a new doll. Tyreese comes in happy about their supplies and their ability to enjoy their new house/camp. Mika bursts out that they should choose to live there. The next day while setting up water to bowl in the kitchen, Carol catches Lizzie playing around with a walker and runs to save her. Pushing Lizzie out of the way, she tackles the walker and stabs it in the head. Lizzie flips out and starts screaming at Carol that killing the walker is the same thing as killing a person and even bellows about if she were to kill Carol. Tyreese catches the incident from the kitchen. Back in the woods, Carol takes Mika on a walk. Pleading that she needs to toughen up, Carol tells her that she is stronger than her sister. On their walk, they find a deer and Carol has Mika prepare to kill it. Mika freezes and admits that she cannot do it. Returning to the house, Tyreese admits that they could forget about their trip to Terminus. He admits that he loves Carol and the girls and that he trusts them. Mika follows Lizzie back out to the train tracks, where she finds Lizzie feeding a rat to the walker they left behind. They get into another argument about the walkers and Lizzie nearly lets herself get bit by it. Out of the woods emerges a group of walkers from the fire, causing the girls to make a break back to the house. Mika gets caught on the barbed wire fence, but Lizzie jumps back to free her and Carol shoots the walker at Mika’s feet in the head. The group lines up and opens fire on the walkers, but Lizzie appears to be emotionally upset about firing at them. That night, Lizzie admits that she had to help stop them but still appears to be struggling with the change to her world. Tyreese continues to appear to have nightmares, but it does not distract the girls from making some pecan treats. The next day, Carol tells Tyreese that she is comfortable with giving up on Terminus and staying at the house. Tyreese is relieved but recounts on his dreams about Karen. He admits that he gets to interact with her in his dreams in a world without the apocalypse, but sometimes he sees someone killing her instead. “The people who are living are haunted by the dead,” he says. “The whole world is haunted now.” Carol struggles to get her words, but she tries to rationalize a positive side to being haunted by the spirits. Tyreese commends her on being there for the girls and the group back at the prison. Continuing on their hunt, Carol tells a joke from when her husband was still alive. They arrive back at the house to find Lizzie standing over her dead sister and Judith crawling on a blanket nearby. She says that she wanted to prove that there was more to walkers and wants to wait for Mika to come back to life. Carol gets Tyreese to take Lizzie and Judith back inside and tells Lizzie that she will just tie up Mika to allow for the change to happen. Carol waits till they go inside, pulls out her knife, and begins to cry. In the house, Tyreese says that he cleared out her room and took away all knives. He says that he finally discovered that she was responsible for the rats at the prison fence and the dissected rabbit in the tombs. While he thinks that she was responsible for Karen, Carol says that she would have wanted Karen to turn. Carol admits that she feel guilty for letting it happen. While trying to figure out what to do, Carol suggests that Lizzie cannot be around other people. Out away from house, Carol takes her to pick flowers for Mika. Lizzie senses that Carol is upset and starts to cry. Carol tries to comfort her and tells her to look at the flowers just before she shoots Lizzie in the back of the head. Tyreese watches from a distance. Carol digs graves in front of the house to bury the two girls. That night now left with just the two of them and Judith, Carol slides over her gun to Tyreese across the table and admits that she killed Karen. She tries to rationalize it as needing to stop the illness from spreading. Tyreese takes a moment before he slowly grips the gun against the table. Carol tells him, “Do what you have to do.” He pauses and then releases the gun. He forgives Carol but says that he will never forget that it happened. Changing his mind from earlier, he says that they should not stay at the house. The next morning, they leave the house and continue toward Terminus. Reaction: Focusing on Carol, Tyreese, and the girls, this episode sought to push each of the characters to their limits in terms of how far they were willing to go for survival and humanity. All of them faced serious issues and two of them had unfortunate results. Mirroring a little of what happened in the comics with the two boys, Lizzie and Mika were victims of the harsh new world. Lizzie was just simply unable to reconcile the reality of the walkers. She had been naming them back at the prison and had never let go of this sense of humanity she believed she saw in walkers. The incident at the train tracks started with her justifying not killing the walker to Tyreese and then getting caught by Mika feeding it a mouse. She thought that she was playing with the one in the grove when Carol had to run out and save her. She was never going to get it that the world had changed and she was in real danger almost all of the time. In Lizzie’s mind, killing her sister was an attempt to make a plea to the adults and prove that there was more to walkers than undead killing machines. She left Carol and Tyreese no choice but to part ways in some fashion, as they were in danger for as long as they continued on together. Even though it appeared that she was upset in the end, she still had not reconciled her choices or opinions about the walkers. Mika grew up quickly in this episode but it did not save her from her sister. There was always going to be that element of looking up to her sister, even when she had to try to calm her down. She had the same innocence that Carol saw in Sophia, who appeared to reemerge in this episode through both of the girls. Carol was working to convince her that she needed to toughen up to survive and could not run away like Sophia did. While Lizzie froze during the first walker attack at the house, Mika rose the occasion and was able to take it down. She did not see what her sister did in the walkers but admitted that she could not kill the living, which was also portrayed through how she could not kill the deer. Carol had seen something growing in her, but it was too late. It was not explained how Lizzie got the jump on Mika, but she was doomed from having a sister obsessed with proving herself. Carol was dealing with trying to raise these girls the right way in this harsh world but also still admittedly had Sophia’s death haunting her. On several occasion, Sophia was brought up both directly and indirectly and it was taking its toll on her. She attempted to spend time with both of the girls at different times throughout the episode and had opportunity to see how different they both were. Mika was sweet and innocent but also smart. She could sense Mika’s growth and understanding of the dangers of the walkers. She could also see that Mika was very much like Sophia. Both of the girls had run for survival but Sophia paid with her life for it, and Carol did not want the same thing to happen to Mika. For Lizzie, she was disconnected from reality and Carol wanted to guide her back. It was not until she found Mika dead that she realized Lizzie had no chance of survival because of her inability to reconcile. Finding Mika dead and having to kill Lizzie was very much like the single story for Sophia, who was discovered turned in the barn and then needing to be killed in front of her. There were mirrors in the way that the girls’ mother’s words came flowing through Carol’s lips in that final moment with Lizzie, but this was an episode for her to relive loss of Sophia. 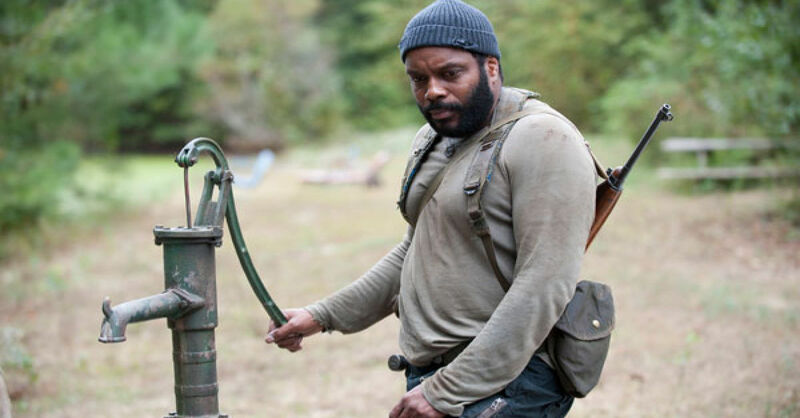 Tyreese was involved in all of the action with Carol and the girls but was going through his own challenges. Suffering from nightmares, he finally admitted that he was dreaming about Karen, sometimes for the better and other times not. He had not let her death go and still was haunted by finding her charred body. The walkers being charred may have brought something out of him with having to kill them, but it was more impactful that he had to deal with Lizzie’s admissions, Mika’s death, and Carol’s huge confession. While he opened up to Carol earlier in the episode, he did not expect her to confess her responsibility for Karen and David. At that moment, he had a chance to finally deal with his anger and frustration. Previously, he had gone berserk and slaughtered walkers, like outside and at the gas station. With everything that he witnessed and experienced with Carol, he finally had an answer and no reason to continue with more bloodshed. Forgiveness was his way of letting the tension and stress go and finding a way to justify his position and need to keep the trust he had in Carol.